Fathers Charles Samson, left, Brian Fischer, John Vien and Paul Rothschild listened to a presentation at the convocation Oct. 9. The convocation offered daily Masses, Holy Hours and evening prayers, confession, presentations and many opportunities to share camaraderie. Dressed casually, wearing lanyard IDs and carrying morning coffee, they looked much like the usual guests heading to a presentation for a conference at Tan-Tar-A Resort at the Lake of the Ozarks. Nothing unusual about this at all … except a crucifix, altar, ambo, organ and more awaited them inside Salon B, where their respectful silence was soon interrupted by the liturgical music of Father John Schneier filling the room and the hallway outside. More than 200 archdiocesan priests gathered for this morning prayer, a daily staple of the 2018 edition of their convocation Oct. 8-12 at the Lake, along with daily Masses, Holy Hours and evening prayers, twice-daily confession availability, presentations and camaraderie, which may have been the key aspect of the gathering. “The presentations at these convocations are not nearly as important as in being together, the renewal of friendships, making new friendships, offering each other fraternal challenge and support,” said Diocese of Colorado Springs Bishop Michael J. Sheridan, the keynote speaker. A native St. Louisan, Bishop Sheridan grew up in Jennings, attended St. Louis University High, Cardinal Glennon College and Kenrick Seminary, and was ordained to the Holy Priesthood by Cardinal John J. Carberry in 1971. He served as St. Louis auxiliary bishop in 1997 before being appointed to Colorado Springs in 2002. 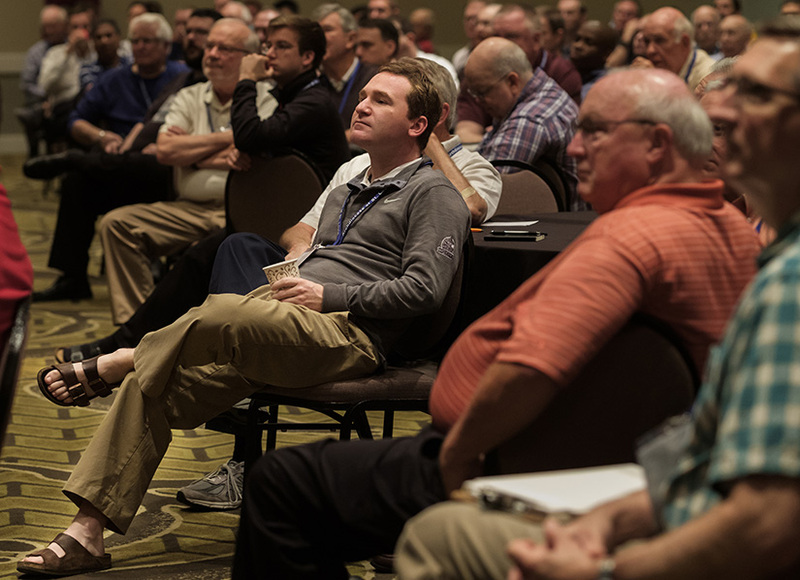 Father Brian Fallon listened to a presentation with other archdiocesan priests at the convocation of priests Oct. 9 at Tan-Tar-A Resort in Osage Beach, Mo. The convocation is held every four years, starting in 1986. Another archdiocesan alum, Archbishop of New York Cardinal Timothy Dolan, joined Bishop Sheridan as a presenter. Cardinal Dolan hosted a day of reflection for the priests. Both appeared at the invitation of Archbishop Robert J. Carlson, who mingled as one of the brother priests during the week. Though Bishop Sheridan and Cardinal Dolan share a St. Louis pedigree, they also share a much deeper bond with archdiocesan priests: an “Intimate Sacramental Brotherhood,” which was the convocation theme this year. Since 1986, the convocation of archdiocesan priests has been held every four years to bring together the men inextricably linked by their ordinations as soldiers of Christ. The sacramental brotherhood makes no distinction between when a man was ordained, whether it was 62 years ago for Father James Schaefer, the senior active priest at the convocation, or this past spring for Fathers Chris Rubie and Gerson Parra. The ordination rite includes the line from Hebrews 7:17: “You are a priest forever according to the order of Melchizedek.” Likewise, the sacramental link of brother priests is forever. “No man is an island, and that’s certainly included for the priesthood,” said Father Rubie, an associate pastor at Immaculate Conception Parish in Dardenne Prairie attending his first convocation. He enjoyed the time with his sacramental brethren, whether vesting and concelebrating Masses, joining them in prayer or kibitzing between presentations or at meals. The priests didn’t just pair off by their ordination years, either. Young priests and senior priests sat together at meals and chatted in hallways, sharing stories and laughter about seminary days, parishes, mutual acquaintances and other shared experiences. In this way, the convocation was the human manifestation of the sacramental brotherhood. The ministry may take many forms, whether in parishes, education, health care or social justice. But as Bishop Sheridan pointed out, the ministries are in the “same apostolate” among sacramental brothers. With a decrease in vocations over the years and an abundance of parishes, having a sacramental brother in close proximity is difficult in this day and age. Many pastors live alone as the sole priest at a parish, and might oversee two or more parishes. However, a sacramental brother is as close as neighboring parishes or within a priest’s deanery. Presenter Father Paul Hoesing, dean of seminarians at Kenrick-Glennon Seminary, stressed the importance of “intentionality” in fostering friendships among sacramental brothers. In other words, they have to make time and plan for those relationships. “We’re all on this together,” said Father James Flavin, a priest from the Archdiocese of Boston and presenter at the Convocation. He stressed human formation of priests and emphasized the importance of social connections to a priest’s health and well-being.